Native American manos from Arizona. A mano (Spanish for hand) is a ground stone tool used with a metate to process or grind food by hand. Manos were used in prehistoric times to process wild seeds, nuts and other food, generally used with greater frequency in the Archaic period, when people became more reliant upon local wild plant food for their diet. 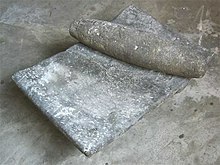 Later, manos and metates were used to process cultivated maize. 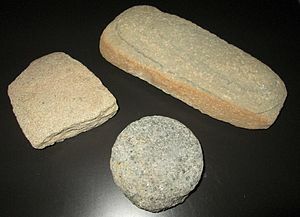 In its early use in the American Southwest, the mano and metate were used to grind wild plants. The mano began as a one-handed tool and once cultivation of maize became more prevalent, the mano became a larger, two-handed tool that more efficiently ground food against an evolved basin or trough metate. Besides food, manos and metates were used to separate and pulverize clay from earthen debris and stones. The resulting clay was used for pottery-making. Ancient Pueblo People often set up work rooms, called mealing rooms, that were established with sets of manos and metates for mass grinding efforts. ^ Mano. Merriam-Webster Dictionary. Retrieved December 9, 2011. ^ Gibbon, Guy E.; Ames, Kenneth M. (1998) Archaeology of Prehistoric Native America: An Encyclopedia. pp. 107, 166. ISBN 0-8153-0725-X. ^ Plog, Stephen. (1997). Ancient Peoples of the American Southwest. London: Thames and Hudson. pp. 68-70. ISBN 0-500-02116-3. ^ Plog, Stephen. (1997). Ancient Peoples of the American Southwest. London: Thames and Hudson. p. 66. ISBN 0-500-02116-3. ^ Sutteon, Mark Q.; Arkush, Brooke S. (2001). Archaeological Laboratory Methods: An Introduction.] Kendall/Hunt Publishing Company. p. 72-75. ISBN 0-7872-8153-0. ^ Plog, Stephen. (1997). Ancient Peoples of the American Southwest. London: Thames and Hudson. p. 80. ISBN 0-500-02116-3. Morris, Donald H. (Summer 1990). "Changes in Groundstone following the introduction of maize into the American Southwest." Journal of Anthropological Research. 46(2). Look up mano in Wiktionary, the free dictionary.